I could not have slept tonight if I had not given those two little birds to their mother. If there’s anything that upsets me more than seeing an animal on the road who’s been hit by a car, it’s knowing that the driver simply kept going. Maybe ― in the case of a squirrel or other small animal — the driver wasn’t aware of what he’d done. But no one could miss the thud of a 30- or 40-pound raccoon. Such was the scene I came upon early this morning: an adult raccoon who had been struck by a car, bleeding from her mouth, lying in the middle of a busy two-lane road. I slowed as I passed and thought I detected some movement — a twitch of her tail, perhaps. 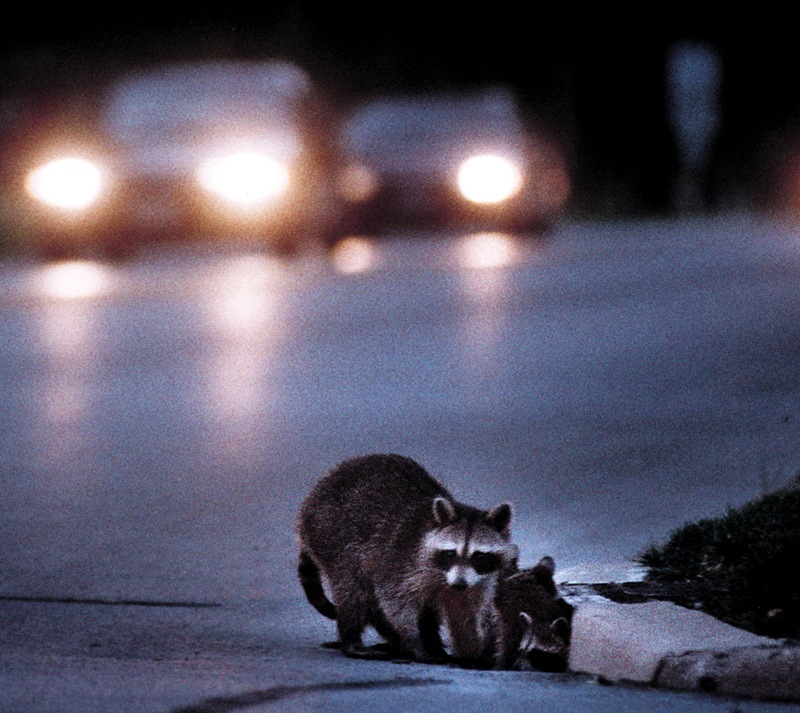 I pulled over and called Animal Control, but the dispatcher said there was nothing they could do to help a raccoon; he suggested I call the county wildlife-rescue center. No thanks, I thought; I’ll do something myself. Who knows how long before someone runs over her. I got out of my truck and approached her carefully; she was clearly alive, the hair on her abdomen rising and falling with each breath. I silently cursed everyone who had been too busy or just too insensitive to stop for this poor creature. Know the locations and phone numbers of your local pet hospital and wildlife-rescue center. Keep a cardboard box with air holes (like this one) in your vehicle, as well as thick gloves and a large towel. Carry these items with you as you move toward the animal. When approaching an injured animal, move slowly and quietly; resist the urge to speak to him. Wearing gloves, gently lift the animal unto the towel and place him into the box and close the lid. If he won’t fit into the box, wrap him in the towel and cover his eyes. Back in your vehicle, keep the radio off. If it’s cold outside, leave the heater on. Don’t speak to the animal. Note the location where you found him. If he can be rehabilitated and released, this will help rehabilitators return him to his home territory. Remember, even if the injured animal does not vocalize, she is scared and in pain. Drive her to your local animal hospital, animal shelter or wildlife-rescue center. If injuries are severe (which would be consistent with being struck by a car), staff will likely euthanize her. That’s not a happy ending, of course, but it’s much better than the fate that would await her lying in the street. NOTE: PETA offers a rescue kit — including a cardboard box, leash and towel — for $14, though it doesn’t include gloves. Footage of battery-caged hens. Video taken inside research labs. Undercover shots of circus cruelty. Activists probably understand better than anyone the transformative power of images, and such videos are readily accessible on YouTube, Google, Yahoo and social-networking sites. Sometimes the resolution is excellent and other times, well, not so much. Television news programs doing a story on animals, however, prefer broadcast-quality video ― and if they can download clips for free from the Internet, all the better. But high-quality video of animals can be hard to acquire, especially when the subject is animal exploitation. Stepping in to meet this demand is the recently launched site FreeAnimalVideo.org. A tool for animal activists as well as mainstream media outlets, FreeAnimalVideo.org is a digital library of video clips offered to anyone at no charge. The site is the brainchild of two Los Angeles-based activists, Sandra Mohr and Patty Shenker. Sandra has been shooting, directing and editing videos for animal causes since the mid-‘90s (among many other projects, she edited the documentary Behind the Mask); Patty is a longtime fixture in the animal-rights movement, well known for her tenacity and generosity. Although the site has only been active since July 1, CNN’s “Headline News” has already used their footage to cover a story about rescued Bolivian lions, and they now host the FreeAnimalVideo.org link on their main page for the show “Issues” with Jane Velez-Mitchell. Videos on FreeAnimalVideo.org are provided by animal-protection organizations, animal sanctuaries and individual activists. Categories include farmed animals, animals used in entertainment, marine animals, pets, animals used in research, wildlife and animals used for fashion and sports. In addition to lions, the site currently offers downloadable clips of tigers, elephants, bison, cows, chickens, pigs, horses, turkeys, sheep, goats and monkeys, as well as shots of animal activists in action. Some of the videos are heartwarming, and some of them are heartbreaking. The idea of humans going mano a mano with a four-legged animal is certainly nothing new. No doubt inspired by the debauchery of ancient Rome — where countless lions, bears, elephants, tigers, and other creatures died in games for human amusement within massive amphitheaters — today’s contests involving animals may be much less grand, but the oppression is the same. From bullfighting and rodeos to kangaroo boxing and lion “taming,” animals are unwilling participants in the trivial pursuit of entertainment. One of the lesser-known games with several variations is pig wrestling. 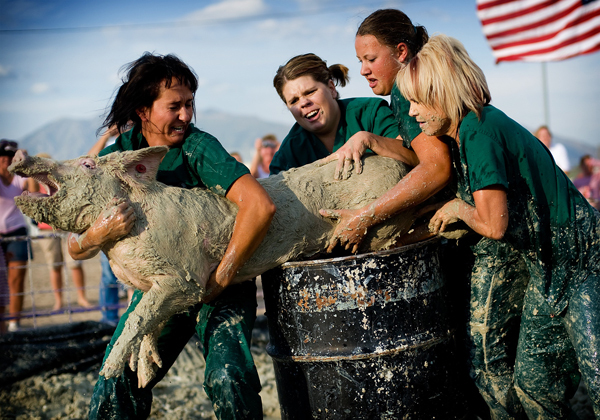 One variation, held in locations throughout Wisconsin every year, calls for participants to catch a pig in a mud-filled pit and attempt to drop him or her into a barrel. There are both men’s and women’s divisions, and the team that gets the pig into the barrel in the shortest time wins. If you have any doubt about whether these events are inhumane, I urge you to study the faces of the pigs in the accompanying photos. One group campaigning to stop this abuse is Alliance for Animals (AFA). If that name sounds familiar, it may be because last month AFA was instrumental in getting a judge to determine that UW-Madison officials may be subject to criminal penalties for fatal decompression experiments involving sheep. Based in Madison, the nonprofit now has its sights set on pig wrestling; they’ve conferred with an attorney and contacted event organizers throughout the state. “Since pig wrestling is between an animal and a person and is not commonly featured at rodeos or bloodless bullfights, we feel this is a crime against animals as per Wisconsin Law,” says Lynn. Moreover, she notes, not only are those who run or participate in pig wrestling competitions breaking the law, but a spectator of such an event is also in violation of Chapter 951 and could face felony charges. So far, the Shawano County Fair, scheduled for Labor Day weekend, cancelled its pig-wrestling event shortly after receiving AFA’s letter. Alliance for Animals was founded in 1983 shortly after thousands of animal rights activists marched past the Wisconsin Regional Primate Research Center during a nationwide protest. 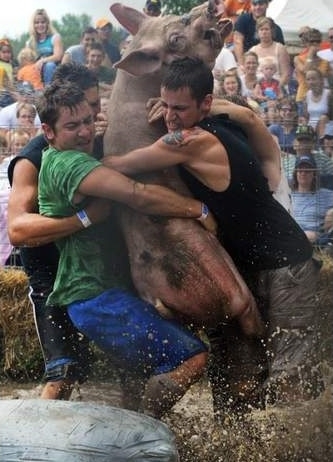 AFA is hoping to get a national group or a donor to help them financially so they can hire an attorney to file charges against organizers of pig-wrestling events. For information on how you can help, please visit nopigwrestling.org.